The secret behind Angelina Jolie’s flawless face has been revealed as she is thought to be a fan of Dragon’s Blood, Rodial’s popular sculpting facial gel. Dubbed the “Liquid Facelift”, Dragon’s Blood works by adding essential volume to hollow skin. It claims to plump, sculpt and lift the complexion whilst protecting against ageing and reducing skin sagging. Celebrity facialist Nuz Shugaa, who works with Rachel Weiz and Amanda Seyfried, as well as Angelina Jolie, says that the mother-of-six relies on the gel to maintain her youthful appearance. “Angelina needs to keep her skin plump and hydrated to maintain the youthful radiance she is famed for,” says Nuz Shugaa. “Lack of sleep, hectic lifestyle with extensive travelling all contribute to depleted levels of hyaluronic acid – which result in the skin looking tired, dry and dull. “This incredibly ageing to all women in their thirties. Angelina Jolie, who is currently preparing to marry long-term love Brad Pitt, has apparently been using the product since February. Dragon’s Blood, which costs $115, is made from the red sap of the sangre de drago tree and sold-out within minutes when it first launched earlier this year. It proved so popular that there were 20,000 eager customers on the waiting list before it went on sale, with Harvey Nichols reporting “queues out the door”. It is considered a less-invasive alternative to fillers, creating a youthful complexion without the needless and avoiding the common problem known as “pillow face”, where the cheeks look “inflated”. 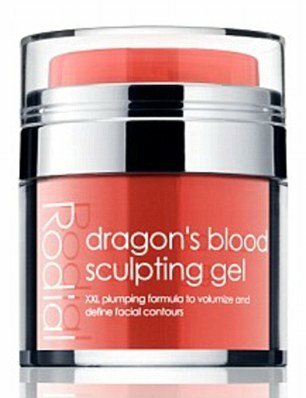 “With our new Dragon’s Blood serum, women including our celebrity fans, are able to regain the youthful fullness in their face,” says a spokesperson for Rodial. “Age, environmental damage and demanding lifestyles all take their toll and age us prematurely, with wrinkles and sagging skin around the eyes and cheeks being some of the first signs. Dragon’s Blood alleviates the need for such cosmetic work as it plumps facial hollows and “orbital troughs” under and around the eyes, as well as for cheek volume and contouring of the chin, forehead and nose. Lady Gaga also uses cream and reportedly used it as she prepared for the Golden Globes earlier this year. During independent trials, 92% of volunteers saw an increase in skin elasticity over three months, while 72% also experienced a reduction in skin sagging. Results also showed that those who used Dragon’s Blood found their skin was dramatically defined and volumised with firmer skin and improved tonicity around the jaw line and cheek bones.